Capture the architectural essence of Chicago with this magnificent set that brings together the iconic Willis Tower™, John Hancock Center, Cloud Gate, DuSable Bridge, Wrigley Building and the Big Red, in an inspirational skyline setting. Each individual LEGO® structure provides a unique and rewarding building experience, with true-to-life color and relative scale depiction. The Chicago River is also represented in the tiled baseplate, adding an extra dimension and feel of authenticity to this wonderful model that focuses on the amazing architectural diversity of one of the world's most beautiful cities. Last known price is 11% below the initial Lego retail price! The Chicago (21033) Lego set is no longer directly available from the sites below. However, 3rd party partners of these sites might still have the set available. 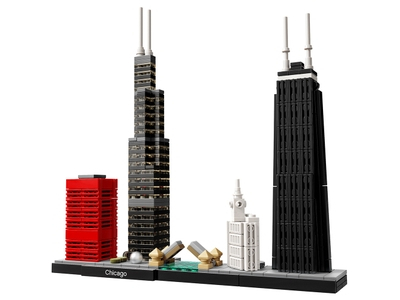 Alternate description Celebrate Chicago with this LEGO® Architecture Skyline model! LEGO® Architecture interpretation of Chicago. Features the Willis Tower™, John Hancock Center, Cloud Gate, DuSable Bridge, Wrigley Building and the Big Red. The Chicago River is represented in the tiled baseplate and the DuSable Bridge opens and closes. The included booklet contains information about the designer, architecture and history of each structure, as well as historical facts about Chicago and its architectural heritage. Includes a 4x32 tiled base with a decorative “Chicago” nameplate. Measures over 7” (20cm) high, 8” (22cm) wide and 1” (5cm) deep.